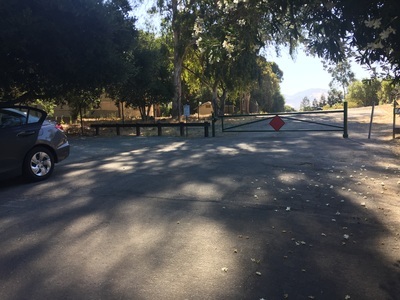 Parking: Free parking at the trailheads at the addresses above. 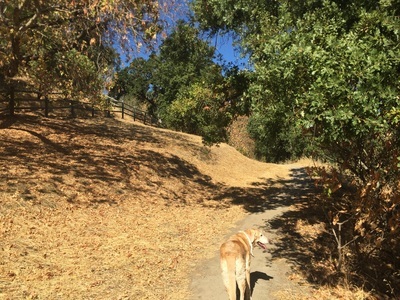 Regulations: Dogs are allowed off-leash if under voice control. 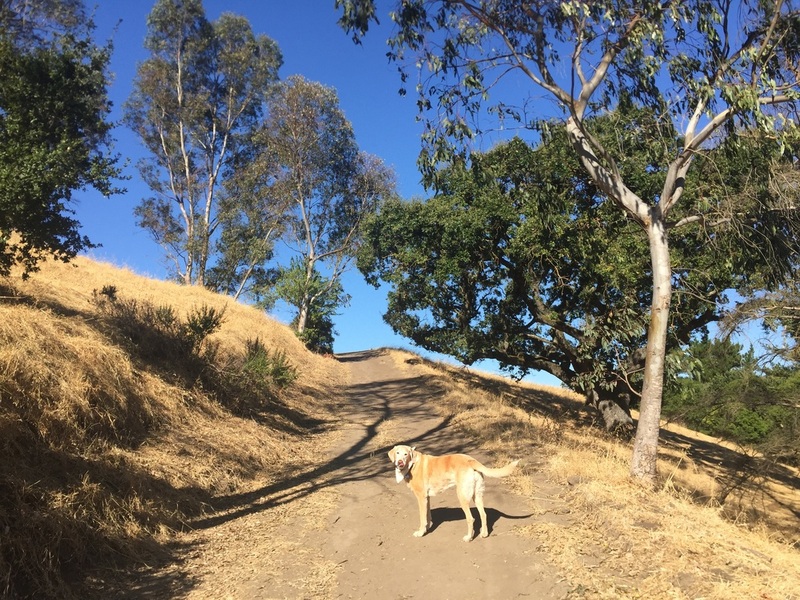 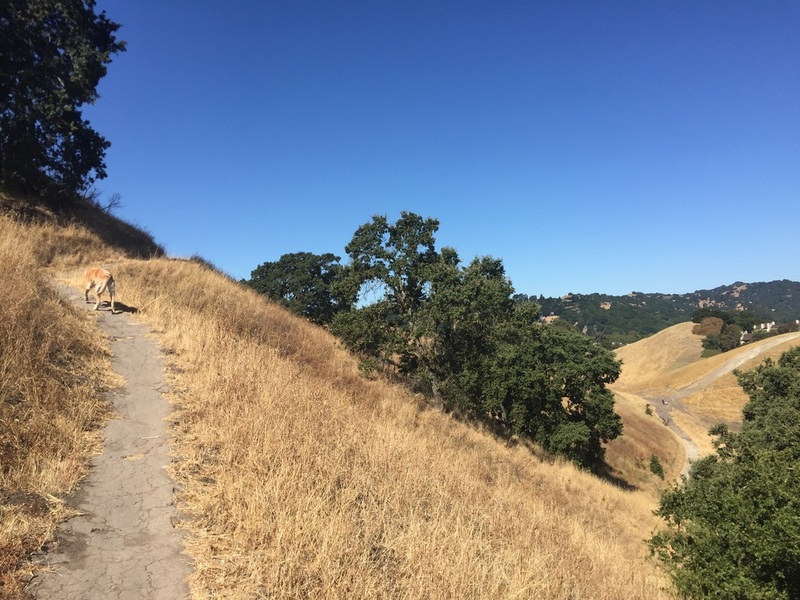 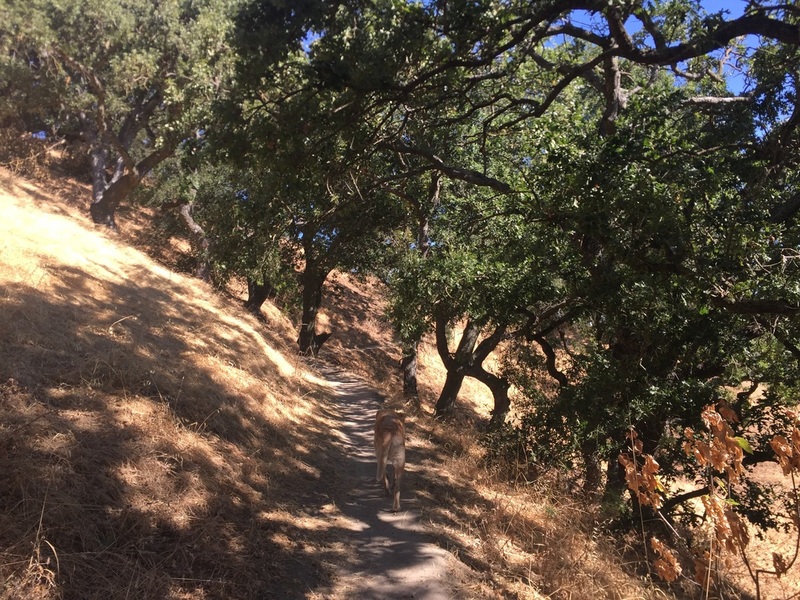 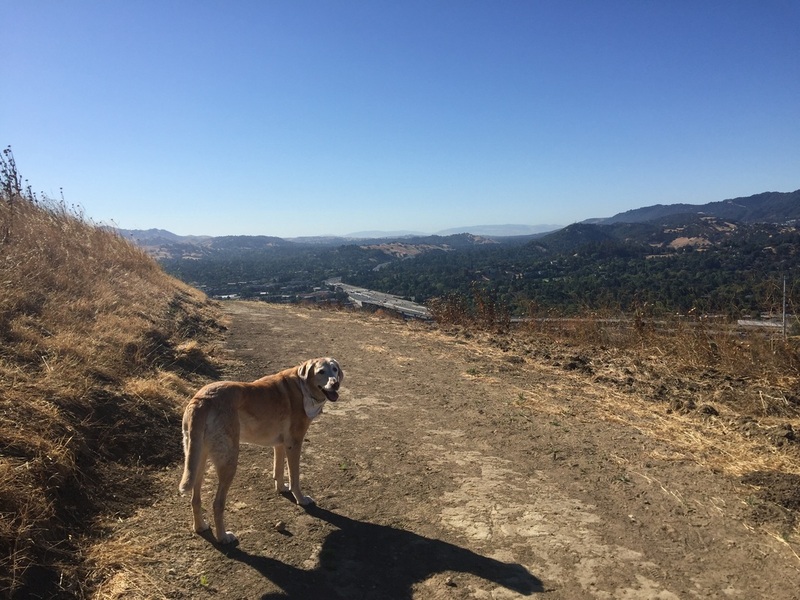 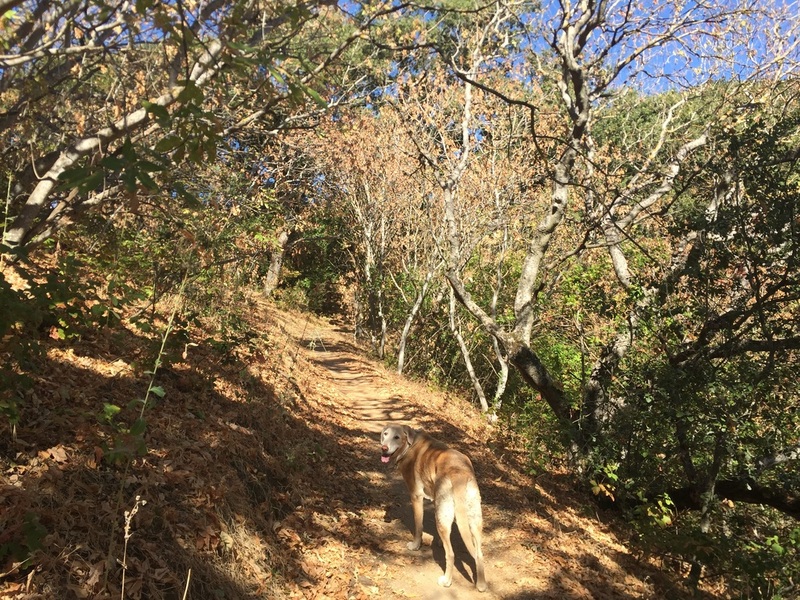 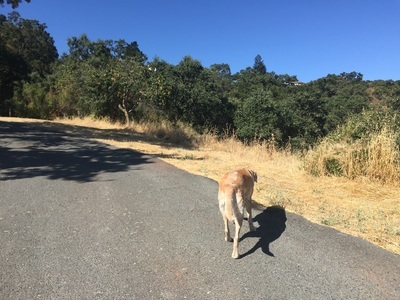 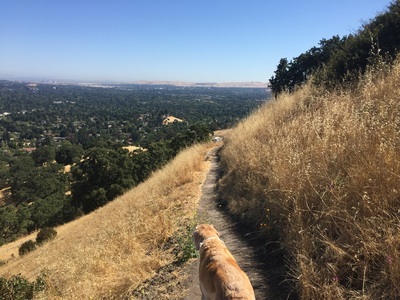 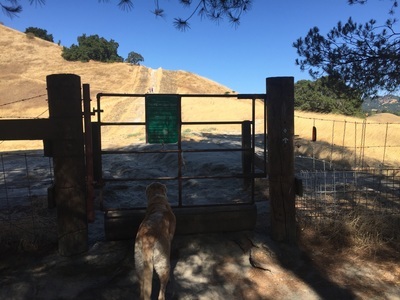 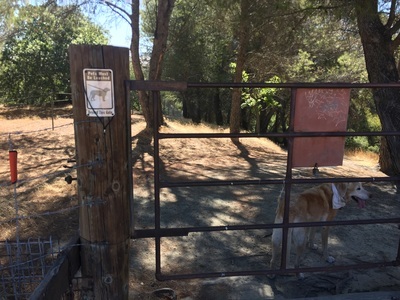 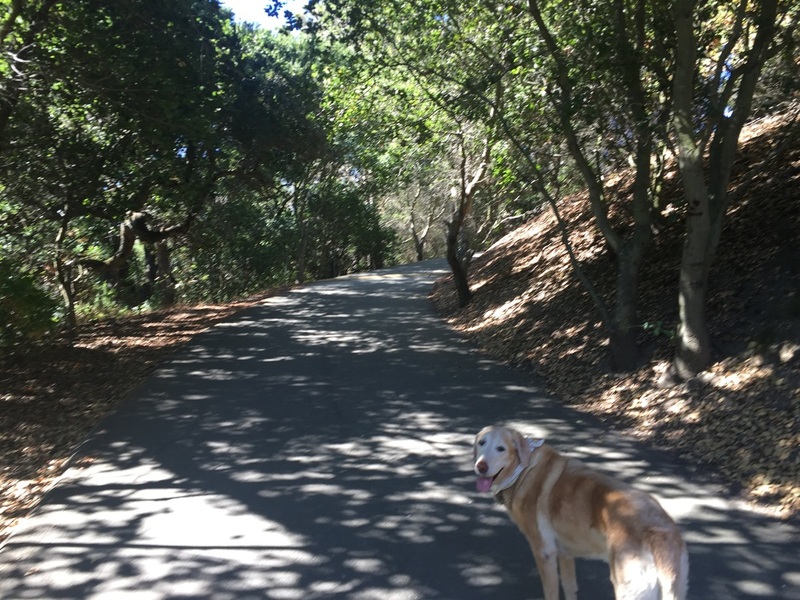 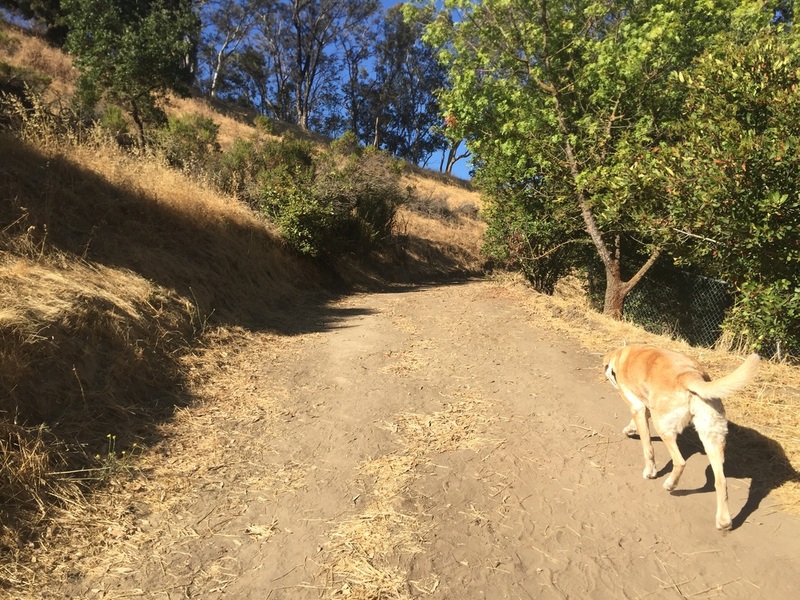 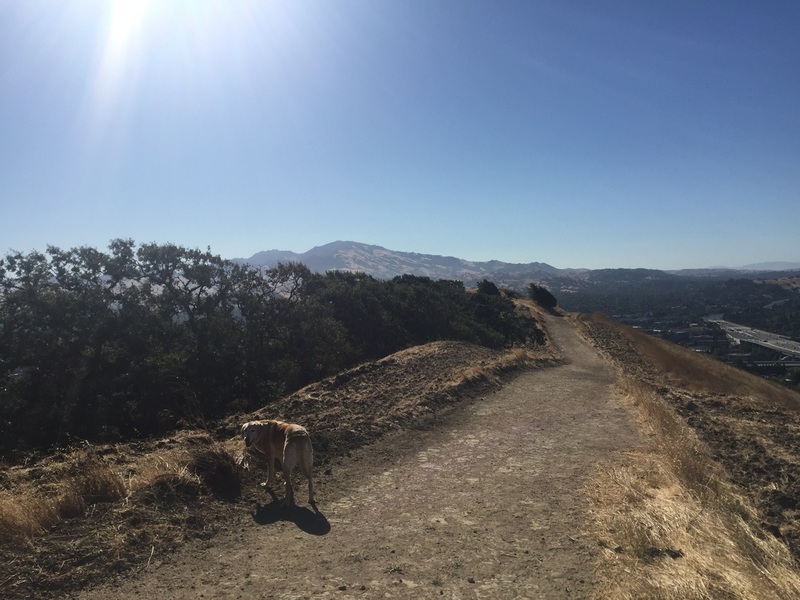 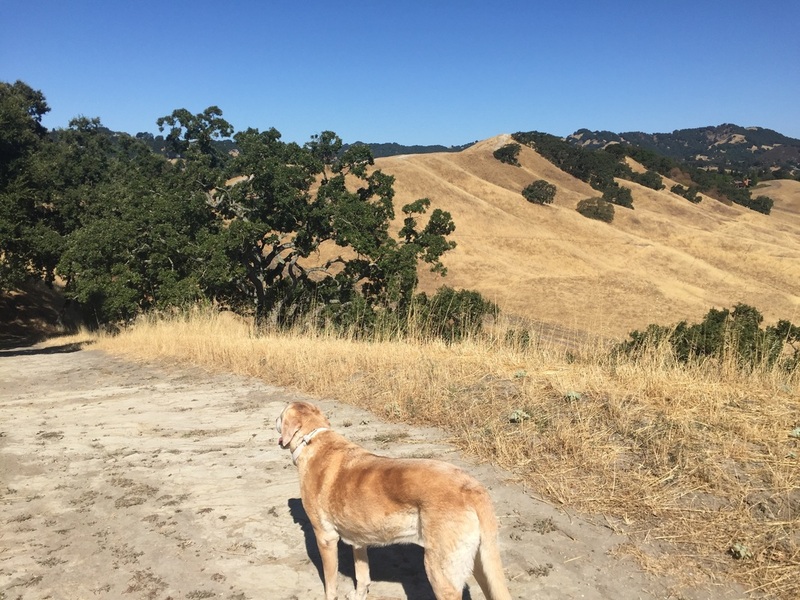 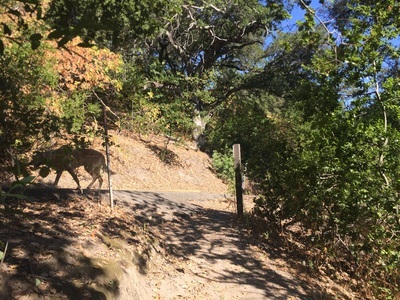 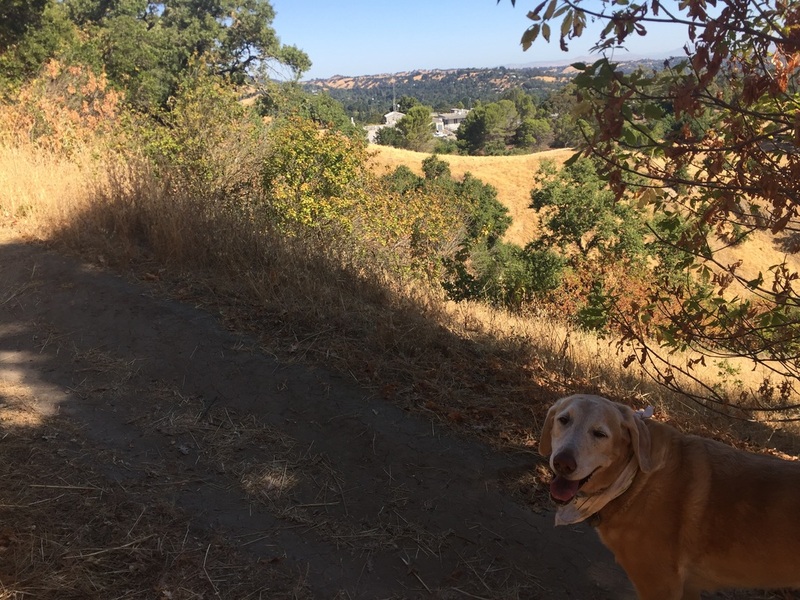 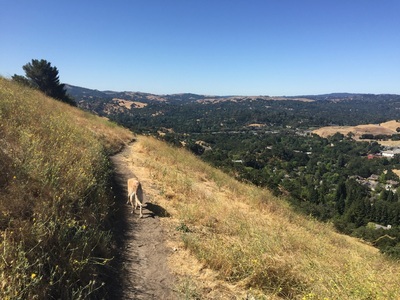 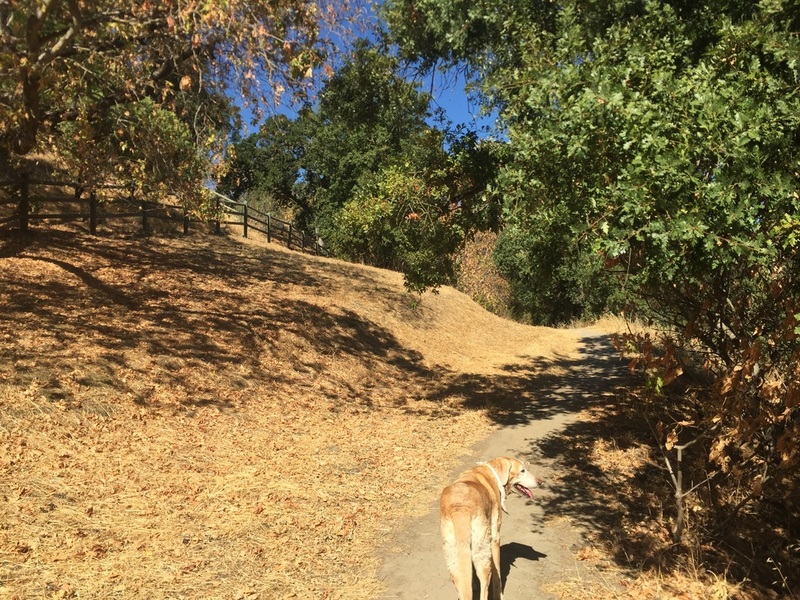 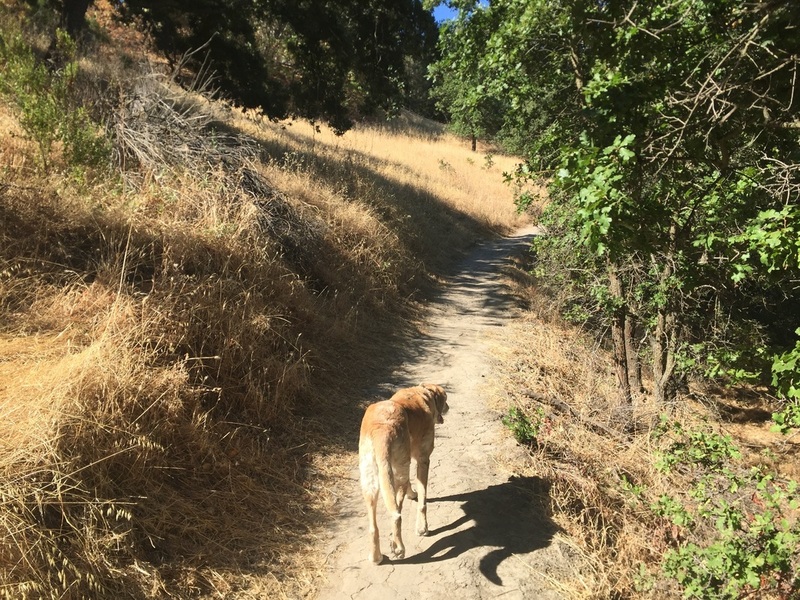 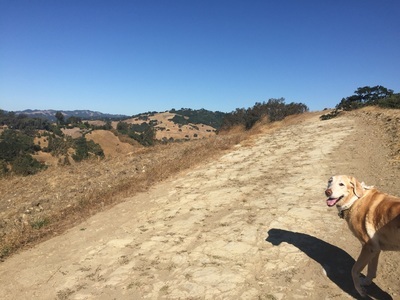 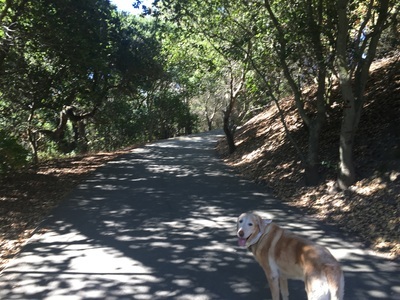 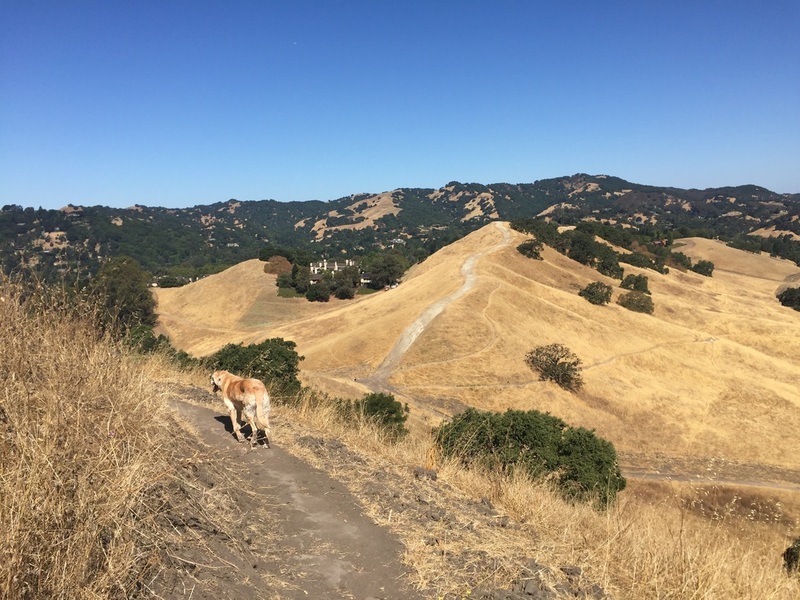 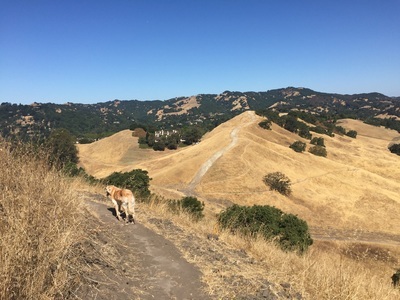 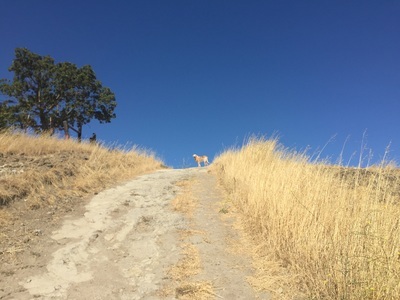 Dogs required to be on leash on the short paved fire road leading up to the water tank in North Acalanes on Sousa Trail. 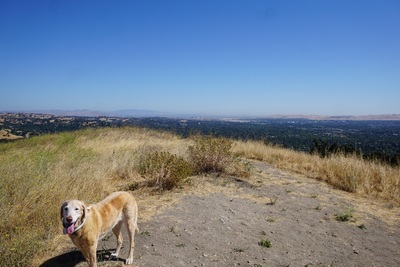 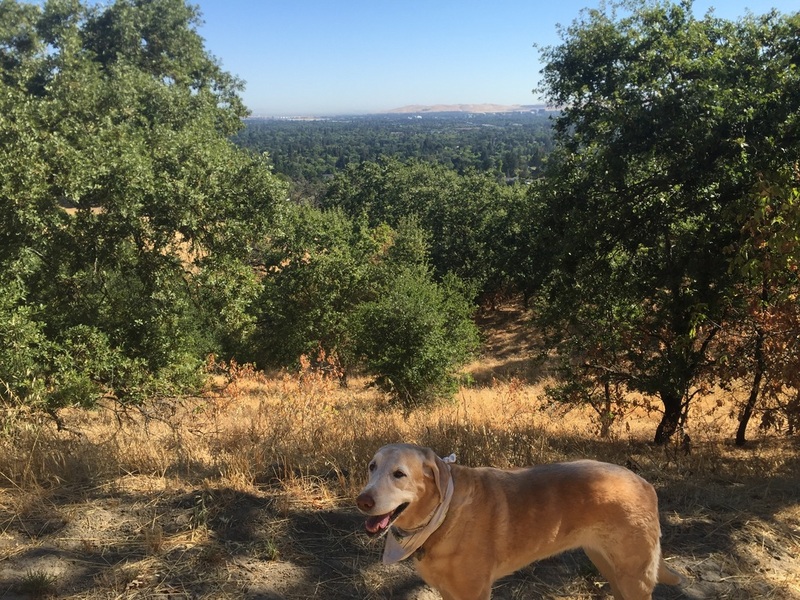 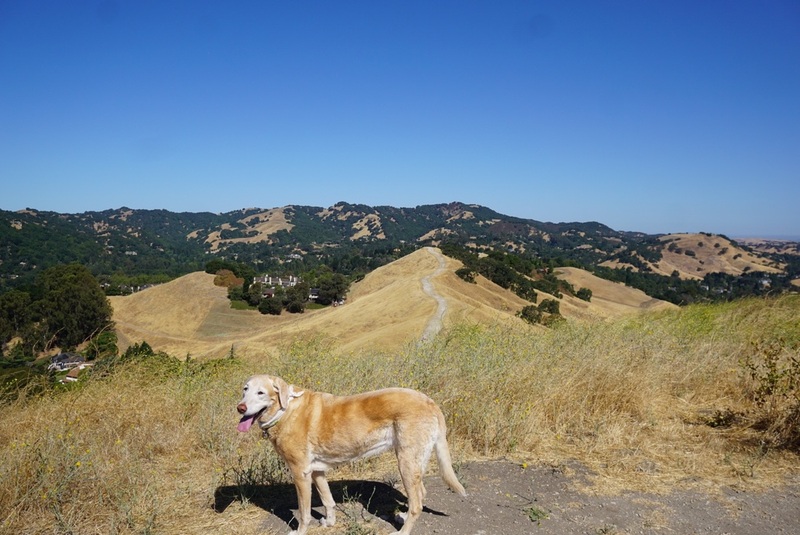 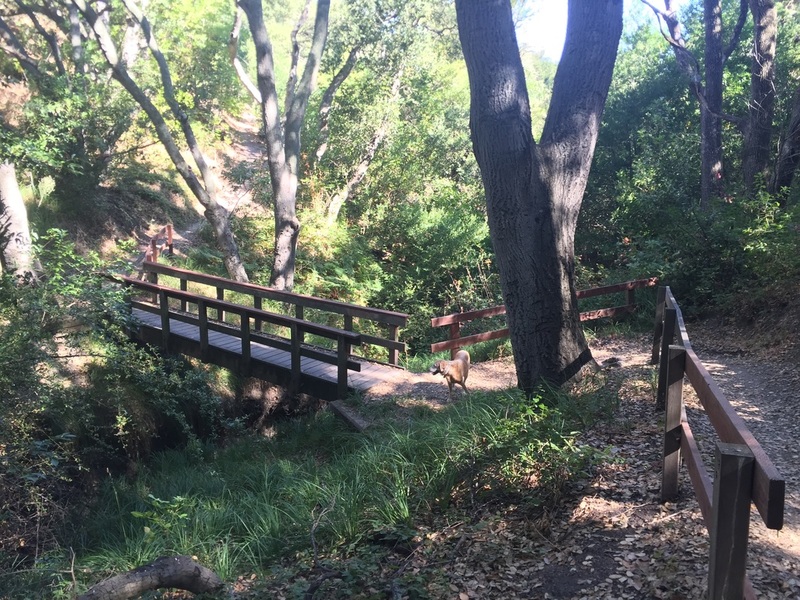 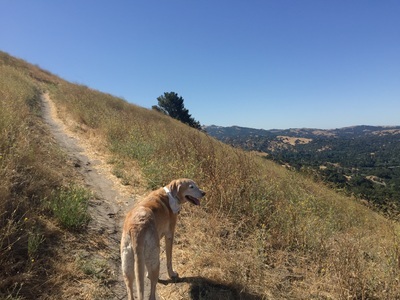 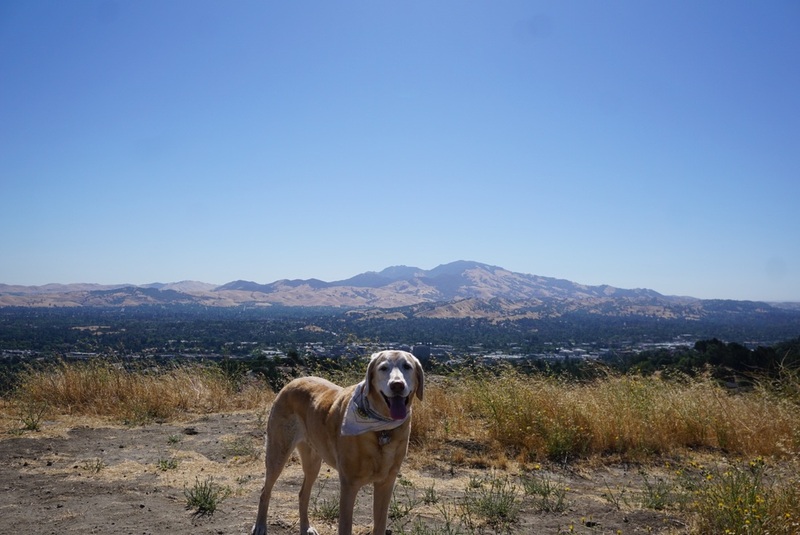 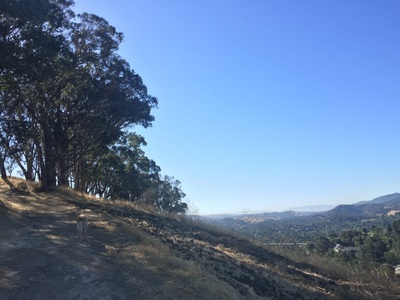 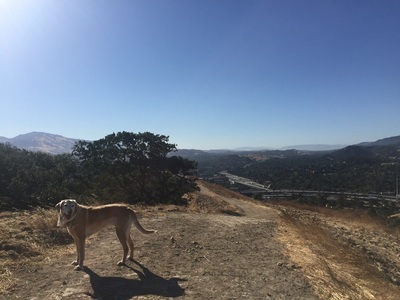 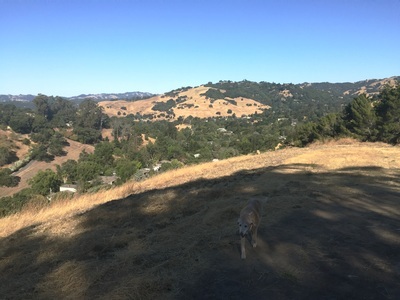 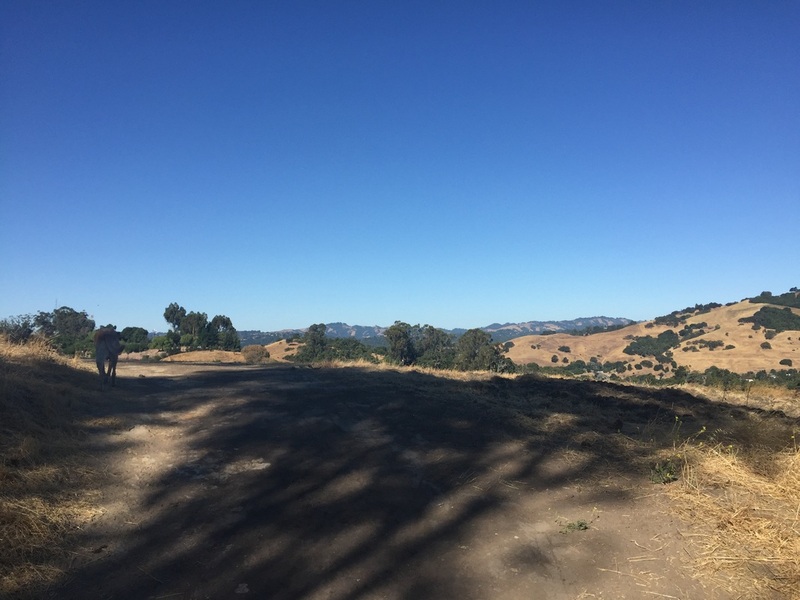 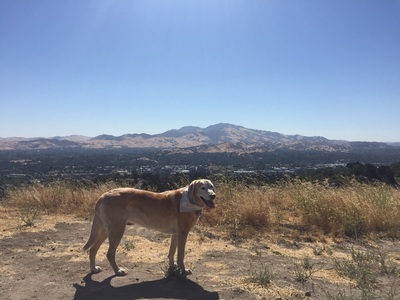 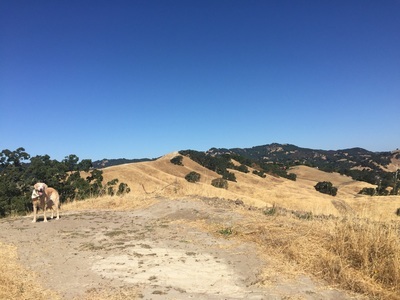 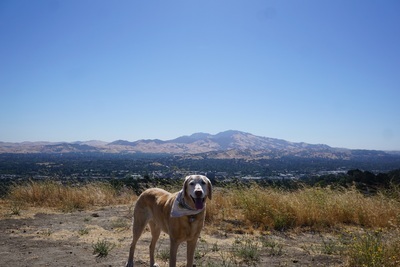 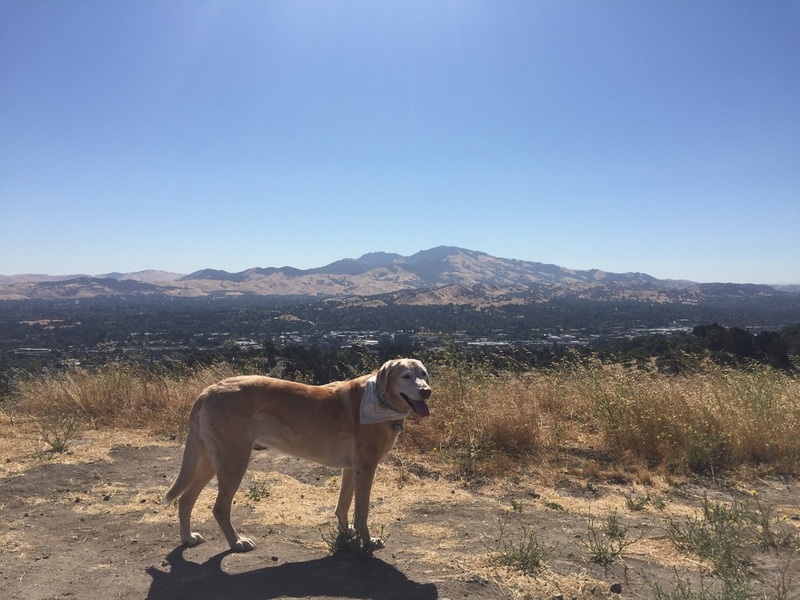 Description: Acalanes Ridge is really two separate parks, separated by almost a mile of residential space in between. 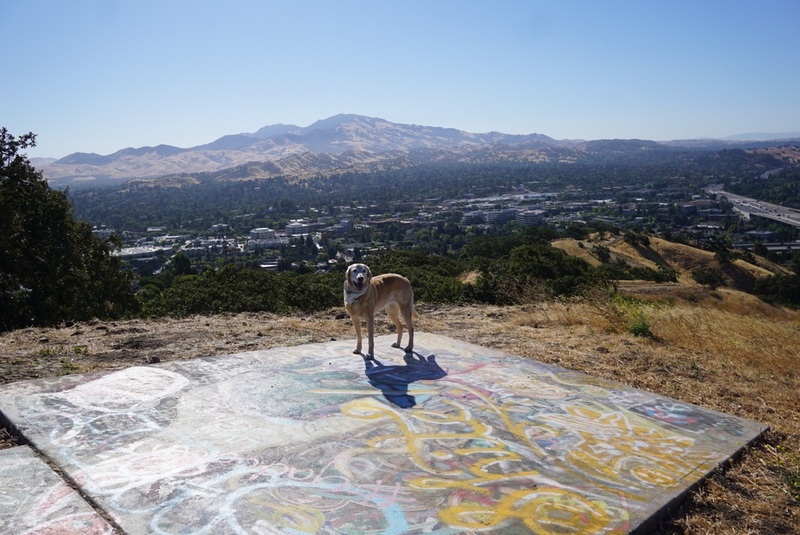 The South side is smaller and less travelled, but offers beautiful views. The dirt trail is almost entirely exposed to sunlight, and snakes up and around, through eucalyptus trees, until reaching the peak at 600ft (the trailhead was at 530ft). 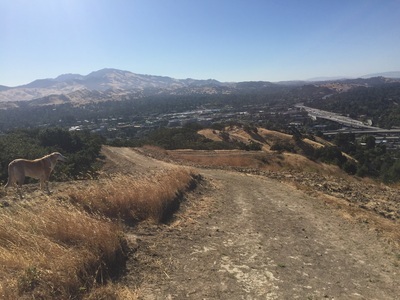 There's a perfectly placed bench at the top where you can stop and admire the 360 degree views. 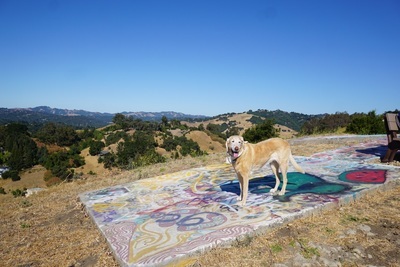 Concrete slabs surrounding the bench have been painted with interesting artwork. 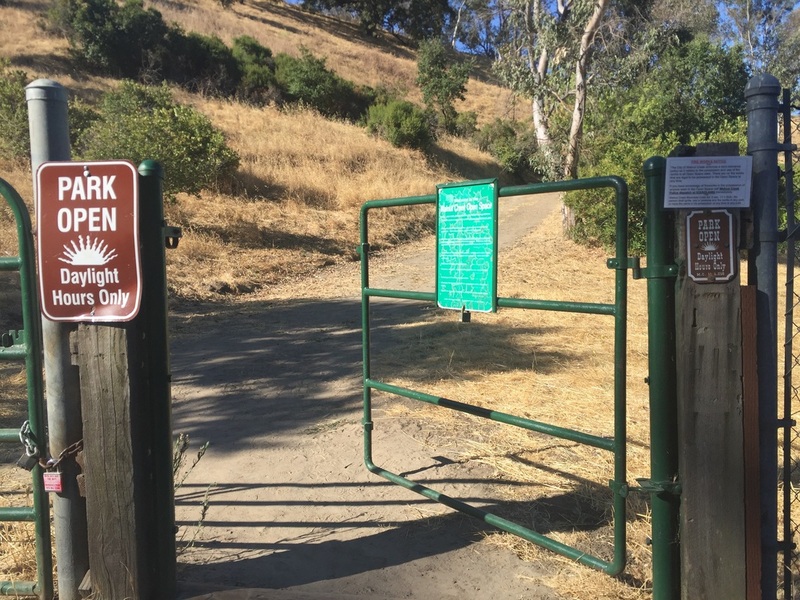 There are no restrooms, trash cans or running water on the south side of the park, so bring plenty of water. 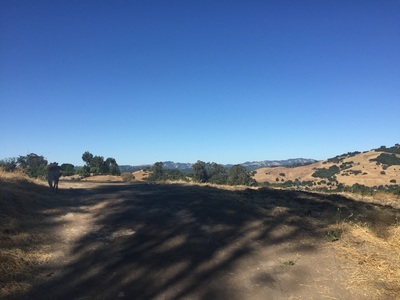 The North Side is larger, with over 200-acres of open space. 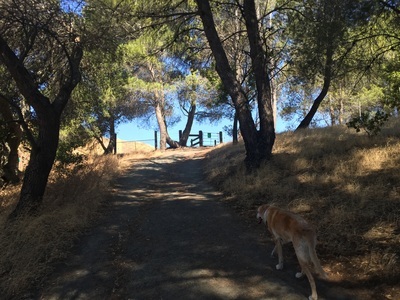 The trail starts out on a shared paved driveway but soon changes to a narrow dirt trail on the right. The trail snakes through tall trees and quickly ascends down into the forest. 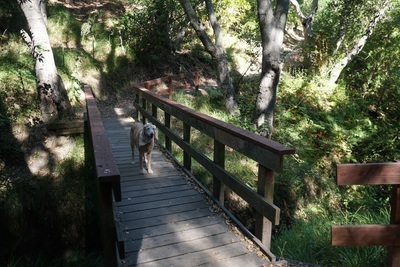 This shady stretch of trail crosses the creek via a wooden bridge, and then climbs back up to a paved fire road. 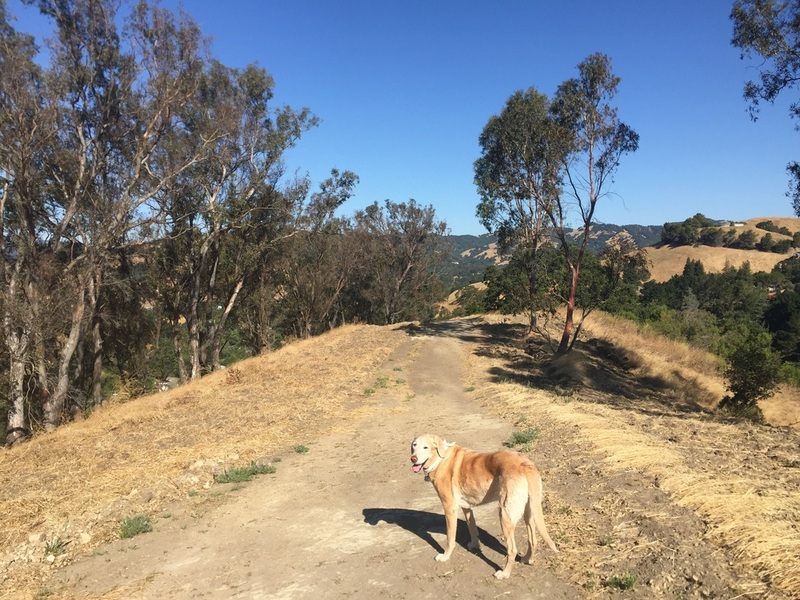 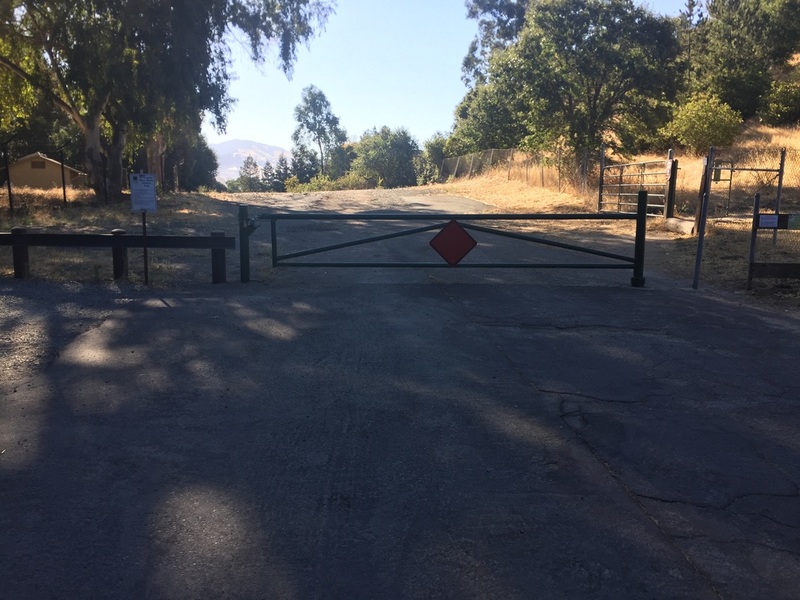 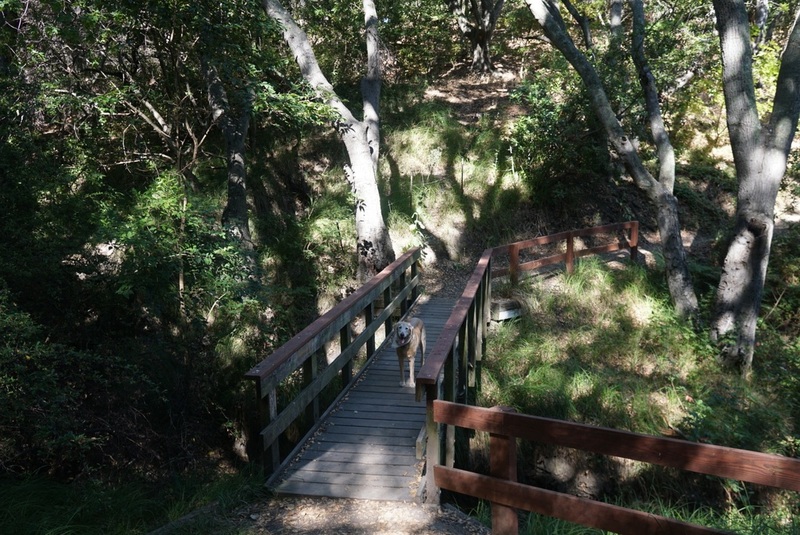 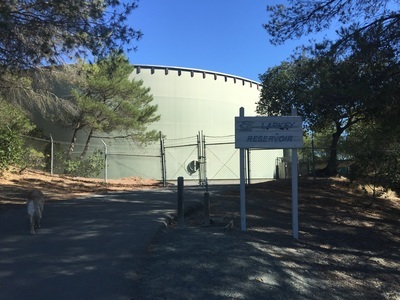 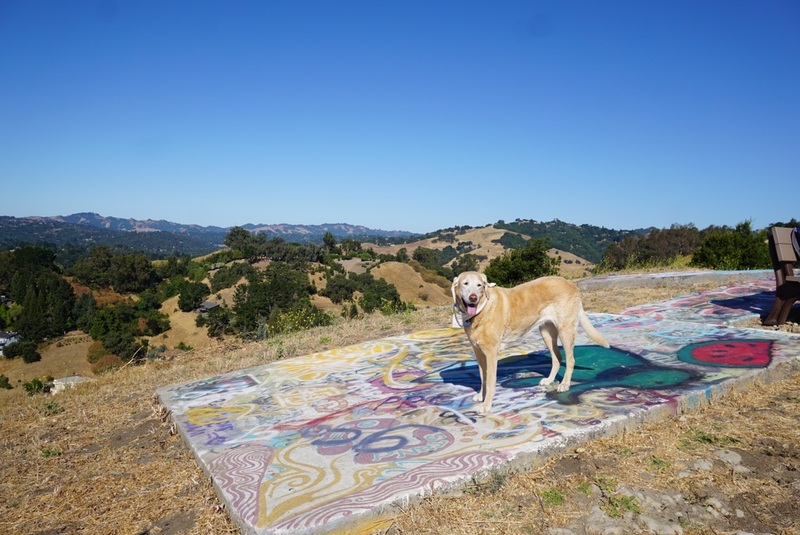 his paved fire road allows EBMUD access to the water tank, so dogs are required to be on leash here for about 0.2 miles. 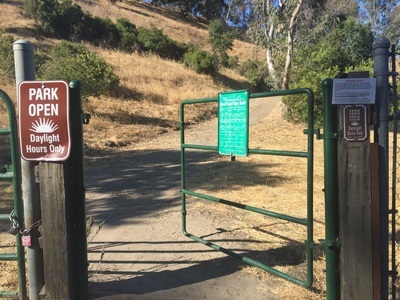 After climbing up the trail you will pass through a gate where the trail splits off in three directions. 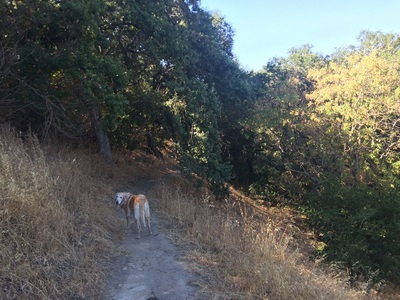 We took the middle trail, which has a short but steep climb uphill. It then circles around the peak where you can hike up to 750ft (Sousa Dr trailhead was at 380ft). 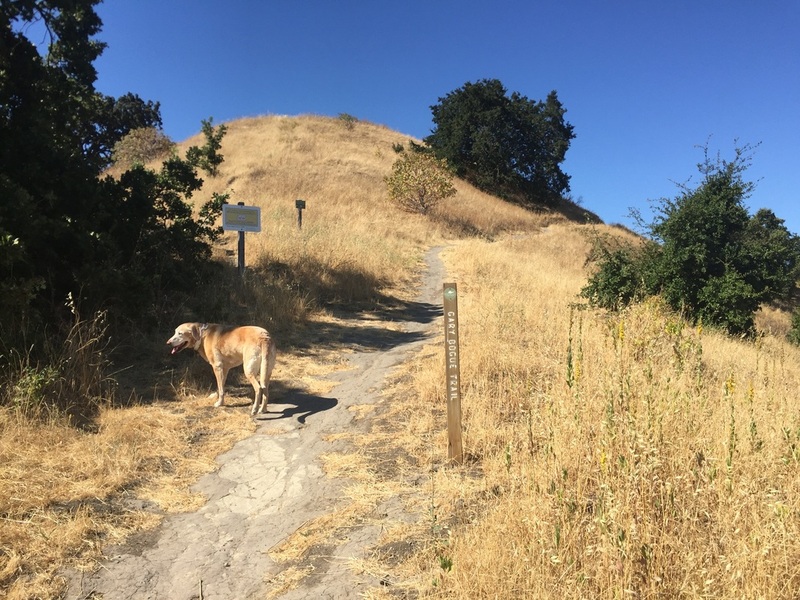 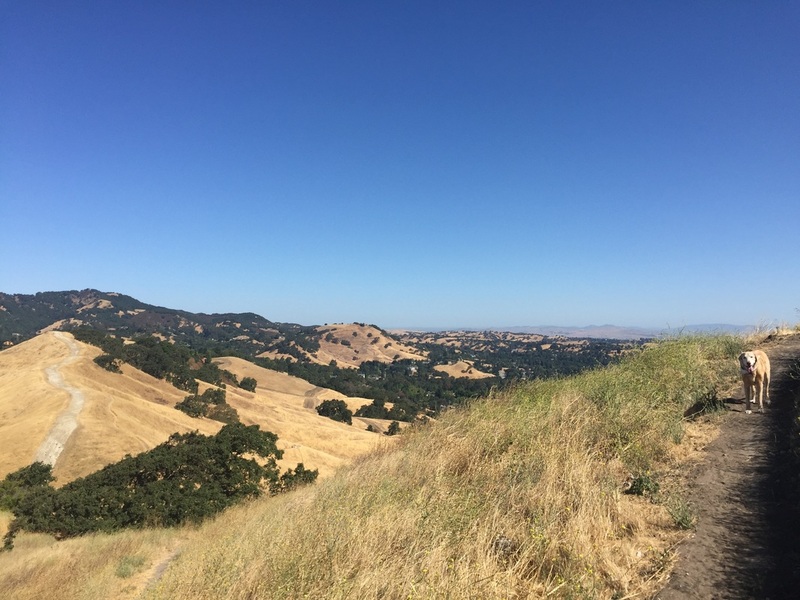 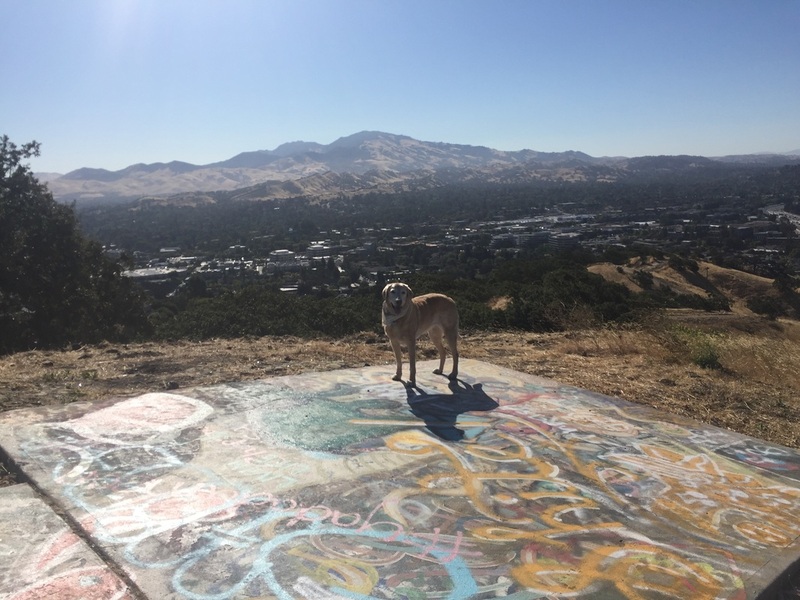 The peak has stunning views of Mount Diablo, Walnut Creek, Shell Ridge, Lime Ridge, Briones Park, the Carquinez Strait and the delta. 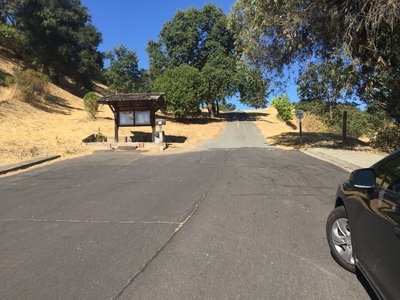 There is a trash can at the Sousa Drive trailhead and a water fountain at the EBUMD Larkey Reservoir Tank, about a half a mile up Sousa Trail.